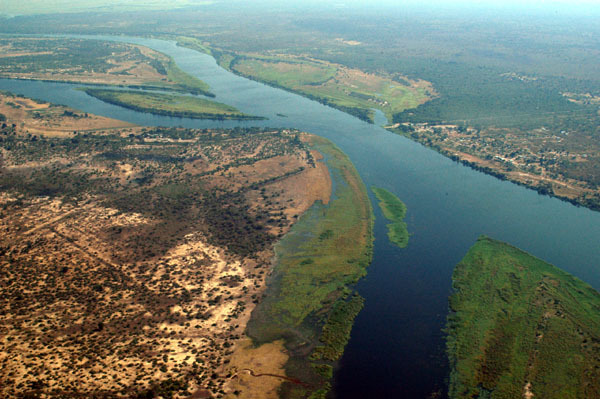 River confluences often reveal differences in color between the two streams. According to Lynch, "the color of each river is determined by many things: type and amount of vegetation in the watershed, geological properties, dissolved chemicals, sediments and biologic content -- usually algae." Lynch also notes that color differences can persist for miles downstream before they finally blend completely. A number of major cities, such as Lyon, Khartoum, and St. Louis, arose at confluences; further examples appear in the list. Within a city, a confluence often forms a visually prominent point, so that confluences are sometimes chosen as the site of prominent public buildings or monuments, as in Koblenz, Lyon, and Winnipeg. Cities also often build parks at confluences, sometimes as projects of municipal improvement, as at Portland and Pittsburgh. 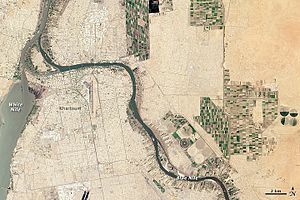 In other cases, a confluence is an industrial site, as in Philadelphia or Mannheim. 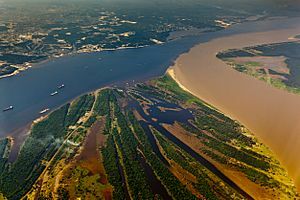 Often a confluence lies in the shared floodplain of the two rivers and nothing is built on it, for example at Manaus, described below. The River Swat empties into the River Kabul near Attock, in Pakistan. The Sangam, near Allahabad, India, where the Yamuna flows into the Ganges. Kuala Lumpur, the capital of Malaysia, is where the Gombak River (previously known as Sungai Lumpur, which means "muddy river") flows into the Klang River. The Jialing flows into the Yangtze at Chongqing in China. The confluence forms a focal point in the city, marked by Chaotianmen Square, built 1998. Visitors to the square behold a vast panorama of ships, bridges, skyscrapers, and people. In the Far East, the Amur forms the international boundary between China and Russia. The Ussuri, which also demarcates the border, flows into the Amur at a point midway between Fuyuan in China and Khabarovsk in Russia. The point of the confluence is located in a rural area, part of China, where a commemorative park, Dongji Square, has been built; it features an enormous sculpture representing the Chinese character for "East". The Amur-Ussuri border region was the location of the Sino-Soviet border conflict of 1969; the borderline near the confluence was settled peacefully by treaty in 2008. 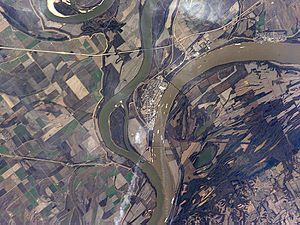 The two largest rivers in Australia, the Murray and its tributary the Darling, converge at Wentworth, New South Wales (see Gallery below for image). Further upstream, the Marne empties into the Seine at Charenton-le-Pont, just southeast of the Paris city limits. The site is dominated by the Huatian Chinagora, a four-star hotel under Chinese management. See Gallery for image. 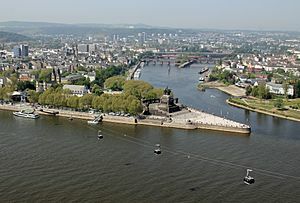 The Main River flows into the Rhine just south of Mainz, in Germany (see Gallery below for image). Passau in Germany is sometimes called the Dreiflüssestadt (City of Three Rivers), because the Danube River is joined there by the Inn River from the south, and the Ilz River emerging from the Bavarian Forest to the north. The Morava flows into the Danube at Devín, on the border between Slovakia and Austria (see Gallery below for image). 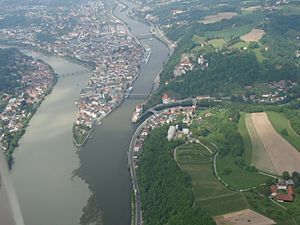 The confluence of the rivers Pivka and Rak is one of the largest subterranean confluences in Europe. The Oka flows into the Volga at Nizhny Novgorod in Russia. The Alexander Nevsky Cathedral overlooks the site. See Gallery below for image. 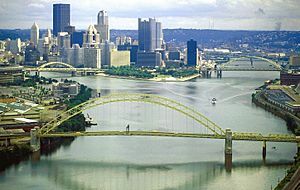 The Ohio River is formed by the confluence of the Monongahela and Allegheny rivers, located in Pittsburgh, Pennsylvania. The site is of great historical significance; in the 1970's it was upgraded by the creation of Point State Park, highlighted by a large fountain. At Ottawa, the capital of Canada, the Rideau River flows -- unusually, as a waterfall -- into the Ottawa River; see Rideau Falls. On the island separating the two portions of the falls is a park with military monuments, among them the Ottawa Memorial. The Green River flows into the Colorado River at the heart of Canyonlands National Park in Utah's Canyon Country. See Gallery below for image. In Portland, Oregon, the Willamette River flows into the Columbia at Kelley Point Park, built on land acquired from the Port of Portland in 1984. See Gallery below for image. Lytton, British Columbia, Canada, is located at the confluence of the muddy Fraser River and the clearer Thompson River (see Gallery below for image). 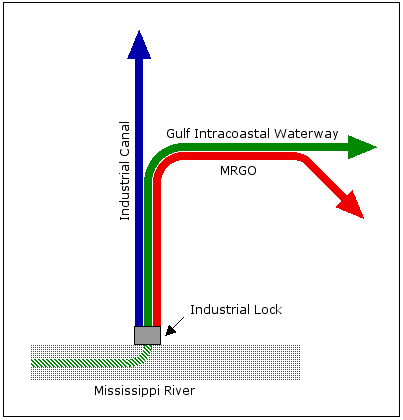 The term confluence also applies to the merger of the flow of two glaciers. For sample images, see Gallery below. Confluence Facts for Kids. Kiddle Encyclopedia.